For me chia seeds are becoming a health food I don’t want to be without. These little seeds are essential in my low carb breakfast and I really love their texture. They are a great source of omega 3 essential fatty acids and are also packed with minerals such phosphorus, calcium and magnesium. You need to remember to soak them to ensure the best absorption of nutrients. I only use them for breakfast at the moment but they could also be used in baking and in salads. There are many brands selling chia seeds on Amazon but I settled for Sevenhills as they seem to be a good value (the organic ones). 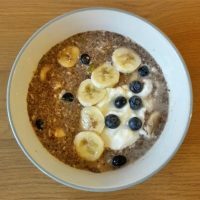 Shelled hemp seeds are another ingredient which I use in breakfast a lot. I add them to my muesli or porridge for extra protein or have them as a main ingredient in my low carb breakfast. They are also great in yoghurt and smoothies. These little seeds are nutritional powerhouse – they contain all essential amino acids and essential fatty acids (omega 3, 6 & 9 in perfect ratio for human health). They also contain various minerals and vitamins such as vitamin E, B3 (niacin), magnesium and iron. Those of you who would like to increase your protein intake, you will be pleased to hear that hemp seeds contain 30% of protein which is really high. On Amazon you will find lots of brands selling shelled hemp seeds but trust me, they are not all the same. I tried many brands in search of the best quality hemp seeds and the best are definitely Linwoods’ Shelled Hemp seeds but they are a little pricey. So I tried to find a cheaper brand which would offer similar quality and the closest are definitely Iswari’s Hemp Seeds which come from Romania. I also tried the following brands which sell hemp seeds: Sevenhills, Buy Whole Foods and Hemp Hearts. The issue I had with these brands were remainings of little shells which stayed with de-shelled hemp seeds after the de-shelling process. Sometimes these get into your teeth or feel hard in your mouth when you are eating so you need to take them out. Although I also found remainings of these shells in Iswari’s hemp seeds, there weren’t that many as in other brands. This is the first time I bought organic pumpkin seeds from Tree of Life and to be honest I am little bit disappointed as they are not the dark green colour I imagined. I will try another brand next time. I use pumpkin seeds in my breakfast or sprinkled on salads such as this one. They are a great source of zinc which is important for immune system and they also contain other minerals and vitamins vital for good health. Apple cider vinegar is essential in my salads but sometimes I also use it as a digestive aid (1 spoon with a glass of water). This is the first time I bought apple cider vinegar from Bragg which is a popular brand that many people seem to recommend. I previously tried organic apple cider vinegar (with mother) from Biona and Raw Health just so I could compare the two. I can now say for sure that Biona’s apple cider vinegar is better than Raw Health’s but now that I bought Bragg’s apple cider vinegar I think this could probably be the best as it’s really cloudy (which is better). I will review it once I tried it. I decided to buy Natvia natural sweetener so I could use it in my low carb breakfast as it’s cheaper than yacon syrup I used previously. This product is great if you are watching your weight and want to reduce your calorie intake. Natvia could be used in porridge, smoothies and in baking. So far I only used it in my breakfast and I find its sweetness ok.
What have you bought on Amazon lately? Do you use Amazon for health foods shopping? I need to use amazon more for health food- it’s so much cheaper. I have some apple cider vinegar in my cupboard and need to start using it! Yes, Amazon is cheaper than some other places and more importantly it just makes your life easier! Quick shopping delivered straight to your home.. 🙂 It’s really worth using apple cider vinegar instead of other vinegars as it has so many health benefits. I feel the same. In my area I don’t really have any health foods stores apart from Holland & Barrett so often I go on Amazon to get what I need, it’s also cheaper than Holland & Barrett most of the time! Thanks! I bought my organic cider vinegar from Tesco but wasn’t aware of the ‘mother’ thing. Not sure if it contains that? I was having it with water before eating to try and sort out my dodgy gut. Not sure if it has any effect though. I couldn’t find any organic cider vinegar with ‘mother’ in normal supermarkets, that’s why I buy mine on Amazon. If it does contain the ‘mother’, it will say on a bottle (it will also be cloudy). I believe that cider vinegar helps with digestion, I came across a few people online who were claiming that it really works for them.